Pontefract, All Saints' Church, windows, etc. bl.uk > Online Gallery Home	> Online exhibitions	> Topographical drawings	> Pontefract, All Saints' Church, windows, etc. 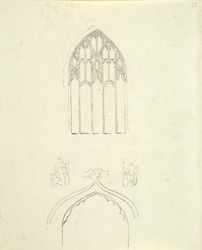 View of a window, showing the elaborate tracery, and view of an archway with carved figures from All Saints' Church, Pontefract. The church, situated near the castle outside of the town, was damaged during the Civil War and then abandoned. It was partly repaired in 1838 and transformed into a smaller church.